Senescence Signalling and Control in Plants discusses the studies showing the importance of hormone action on developmental senescence. It shows the involvement of various signaling components (such as EIN2, LOX2) and transcription factors (such as oresara1 or ORE1) in controlling hormonal activity during senescence. Further, the involvement of various micro RNAs (miR164, miR319) in regulating leaf senescence are discussed. 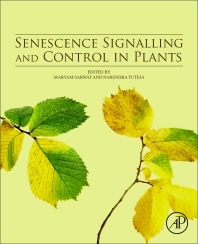 Through this book, the authors throw light on all the reverse and forward genetic approaches to reveal the role of various other phytohormones regulating plant senescence and the molecular mechanisms involved. Chapters on relevant topics are contributed by experts working in the area, making this a comprehensive treatise designed to provide an in-depth analysis on the subject matter. Dr. Maryam Sarwat is Senior Assistant Professor of Pharmaceutical Biotechnology at Amity Institute of Pharmacy, Amity University, Noida, India. She has presented her research in various conferences nationally as well as internationally (France, the Czech Republic, and Germany). Based on her research findings, Dr. Sarwat has filed two patents. She has 25 international publications. She received the Scientist of the Year award in 2015 from the International Board of Awards of the National Academy of Environmental Sciences of India. She is the author of Stress Signalling in Plants, Genomics and Proteomics Perspective (Springer 2013). An elected fellow of numerous national & international academies, Dr. Narendra Tuteja is currently Professor and head at Amity Institute of Microbial Technology, NOIDA, India, and visiting Scientist at International Centre for Genetic Engineering & Biotechnology (ICGEB), New Delhi, India. He has made significant contributions to crop improvement under adverse conditions, reporting the first helicase from plant and human cells and demonstrating new roles of Ku autoantigen, nucleolin and eIF4A as DNA helicases. Furthermore, he discovered novel functions of helicases, G-proteins, CBL-CIPK and LecRLK in plant stress tolerance, and PLC and MAP-kinase as effectors for Gα and Gβ G-proteins. Narendra Tuteja also reported several high salinity stress tolerant genes from plants and fungi and developed salt/drought tolerant plants.